NOVA Filmhouse, Inc. A Hundred Years of Hollywood History: Part 2 - NOVA Filmhouse, Inc. In 1938 the US Supreme Court ruled that the major studios held a monopoly and issued an antitrust action in United States vs. Paramount Pictures. Two years later the majors agreed to stop buying theaters and eliminate blind blocking (which required theaters to show a film without seeing it first.) However, four years later, the majors still held a monopoly. Another antitrust action addressed the five majors who responded by divesting themselves of all theaters. The majors were no longer exhibitors (theater owners). This created a huge problem because the big banks (who had previously financed the majors’ productions) were reluctant to finance their future films. 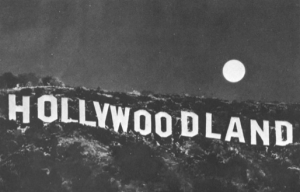 This led to the majors’ decision to leave the production of films to independent studios. A major studio is defined as a distribution company that releases a substantial number of films and that consistently commands a significant share of box office revenues. The major studios also produce a relatively small number of higher budget films per year; some of these type of films are called “tent poles”: films that often have larger budgets, and refer to a motion picture that is expected to hold up and ‘balance out’ the financial performance of the studio (examples: Spiderman, Transformers, Harry Potter movies, The Lord of the Rings franchise, etc.) However, many of the films released by the major studios are produced by independents (non-major studio productions). As of 2013 there are six major studios: Paramount Pictures, 20th Century Fox, Universal, Warner Bros (who now includes New Line Cinema), Columbia Pictures (whose parent company, Sony, now owns MGM and United Artists), and The Walt Disney Company (Disney is often seen as a separate entity, focusing more on animation and family entertainment). Independent studios work similarly to a major studio, though their focus is usually on production and they use more modest budgets than the majors. They produce and distribute often themselves, though sometimes they will bring their projects to one of the majors for distribution. One of the biggest differences between the majors and the independent is that, in today’s industry, the major studios produce less original content and more sequels or tent poles, as mentioned. Independent studios are responsible for production as well as financing and sometimes, distribution. Another significant difference between the major studios and the independent studios is that the majors are owned by very large public corporations (with the notable exception of The Walt Disney Company, which is a public company, but is not owned by anybody else): Fox Entertainment (formally News Corp) is the parent company of 20th Century Fox; Viacom is the parent of Paramount Pictures; Warner Brothers is owned by Time Warner; Columbia, MGM, and United Artists owned by Sony; and Universal is owned by Comcast through its wholly owned subsidiary NBCUniversal. In recent years the independents are increasing their market share at a higher rate than the majors. The independent studios’ share of the market went from 13.4% in 2000 to almost 20% in 2013! 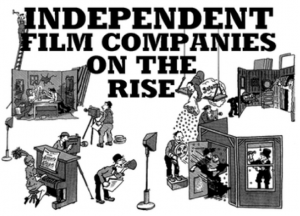 The picture is even brighter for independents when you consider that a significant number of independent productions have been distributed by the majors, and therefore the true share of the independents in the market is much higher. 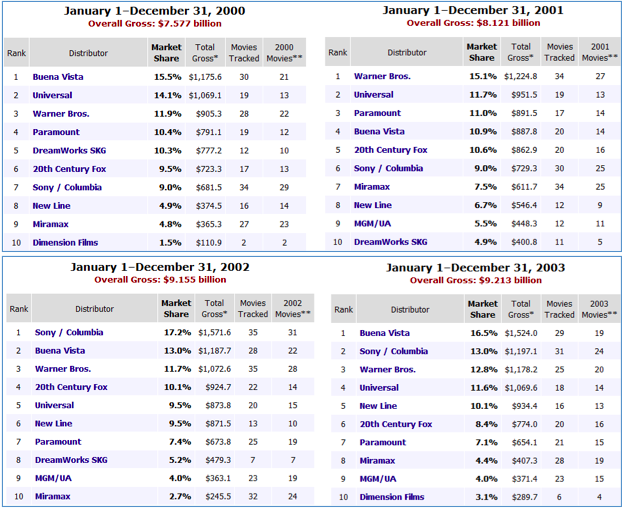 When looking at the data from 2002 (see chart below) one can see that New Line Cinema surpassed Paramount, and essentially tied with Universal, in market share! This is in spite of the fact that New Line had produced less movies than Paramount and Universal. This all happened under the leadership of New Line’s Chairman of Production Sarah Risher, the last year she held that post. Sara Risher is currently the Co-CEO/ President of Nova Filmhouse. All financial indications confirm that New Line Cinema has been the most successful independent studio in Hollywood’s 100 plus year history!